BMW's 5-series GT wagon will be based on this concept shown at the Geneva auto show. BMW AG is preparing to launch another crossover -- the 5-series Gran Turismo -- that aspires to be a stylish heir to the dowdy minivan. The pricey five-door, rear-drive wagon will debut at the Frankfurt auto show in September and go on sale in Europe and the United States in the fourth quarter. A concept version was shown at the Geneva show in March. BMW released some details about the vehicle. Pricing will start “in the high sixties,” a spokesman said. He did not predict sales numbers but said the 5-series GT will be a niche model. Like the Mercedes-Benz R class and BMW X6, the 5-series GT is targeted at buyers who want minivan-like utility but shy away from anything that might be called a minivan. The car is shorter than the R class and longer than the X6. The GT's success depends on its being marketed as “an alternative” to the X5 and X6 crossovers rather than a utilitarian people hauler, said Jim O'Donnell, BMW of North America CEO. Mercedes-Benz has struggled with the R class since its 2005 launch. Next year's freshening will give the vehicle a new front end similar to Mercedes' SUVs, insiders say. 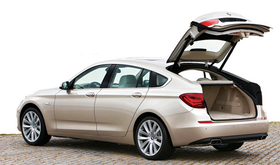 O'Donnell said dealers previewed the 5-series GT last September in Munich. “They see it as versatile, but it's definitely not a minivan,” he said. BMW executives say the vehicle has the attributes of a sedan, an SUV and a classic GT. The seats are higher than those of the 5 series but are lower than the X3's. The drivetrain and underpinnings come from the next-generation 5 series, due next year.